“Have courage and be kind,” says the dying mother of young Ella (pre-cinders) to her daughter. One wishes that director Kenneth Branagh (former Shakespearean since turned Marvelite) had heeded the first part of that advice, for while his new version of this oft-told tale (from a script by Chris Weitz, of American Pie and About a Boy fame) is full of lovely images and lovely … love … it adds very little that is new, unlike last summer’s flawed but innovative Maleficent (itself an adaptation of Sleeping Beauty). Unless one considers that this is the first time I can remember a happy childhood preceding Cinderella’s downfall (and subsequent rise again). Still, a biological mother who comes before the wicked stepmom does not a storytelling raison d’être make. And since the 1950 Disney movie, sentimentality and all, is such a pop-culture touchstone (“Bibbidi-Bobbidi-Boo,” anyone?) – or was, once, anyway – it would be nice to see some updates to the story that explain why Disney felt the need to make it all over again (well, there’s money, for sure). To those who may have grown up in the forest, raised by wolves (actually, you might know this and other fairy tales quite well if you had), Cinderella is about a young woman who’s widowed father remarries, then dies, leaving his orphan girl in the clutches of a woman whose only care in the world is her own two (spoiled) biological daughters. Together with her spawn, this evil stepmother treats Cinderella like a servant girl. When the Prince of the Kingdom announces a ball to which all maidens – regardless of social origin – are invited, Cinderella’s three tormenters lock her up to prevent her from going. Fortunately, young Cinderella just happens to have a fairy godmother, and this enchanted creature sends her charge to the ball in stunning raiment – including glass slippers – of magical provenance, though with the exhortation to leave before midnight, when the spell will expire. Once there, Cinderella charms the Prince, loses track of time, and then flees when the clock begins to strike 12, losing a slipper on her way out. Smitten, the Prince pursues her, but she escapes before he can see her in her plain, ordinary clothing. In the days and weeks ahead, he criss-crosses the territory, asking every woman to try on the shoe. And then, one day, despite the nefarious efforts of the stepmom and her nasty children, the Prince finds his lost love, marries her, and he and Cinderella live happily ever after. The end. And that, folks, is the exact story of Branagh’s and Weitz’s movie. True, it’s live action, rather than animation (though with CGI, which means it’s at least half-animated), but the plot deviates not one iota from that basic outline. It is entertaining, and filled with charismatic actors, but we’ve seen this movie before. So why go? 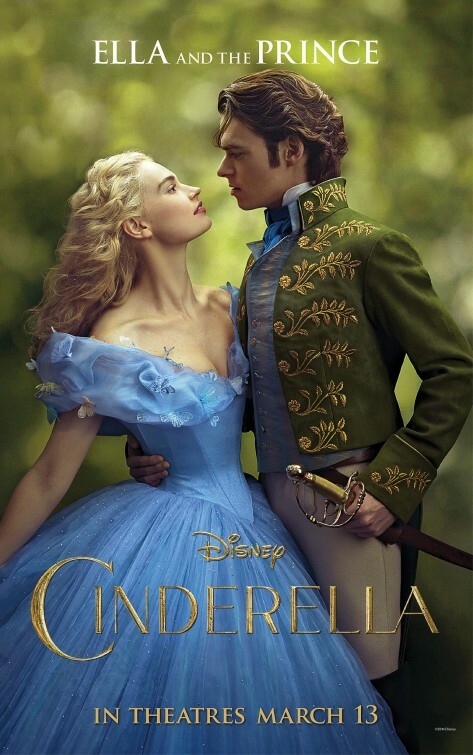 Well, for one very good reason: the chemistry between the two leads, Lily James (Lady Rose MacClare on “Downton Abbey“) as Cinderella and Richard Madden (Robb Stark on “Game of Thrones“) as the Prince. Oh, other quality performers are around, for show, including Cate Blanchett (Blue Jasmine) as the stepmother and Derek Jacobi (Stuart Bixby in “Vicious“) as the King, but it is James and Madden who make this movie worth watching. In particular, it is the three extended scenes they share that are profoundly moving: their first meeting in the forest; at the ball; and the final slipper test. Branagh and his two main actors get young love right. We feel the excitement of two people falling for each other for the first time, and it is a supreme delight to share in their joy. The dance at the ball is especially lovely, and Branagh’s mise-en-scène as Cinderella first appears takes the gathered attendees’ breath away, and ours, as well. So while the script may be a bit bland, there is nothing dull about the central love story. See it for that, if for nothing else.